One of my friends posted it, and it has been ‘haunting’ me. I don’t know why. Maybe it’s her eyes. Posted in Uncategorized and tagged Facebook, image, Mirror, Women. Bookmark the permalink. Wow. So much here. She’s only a part of her whole self. Amazing photography. Intriguing and a little creepy too. Like she’s disappearing. 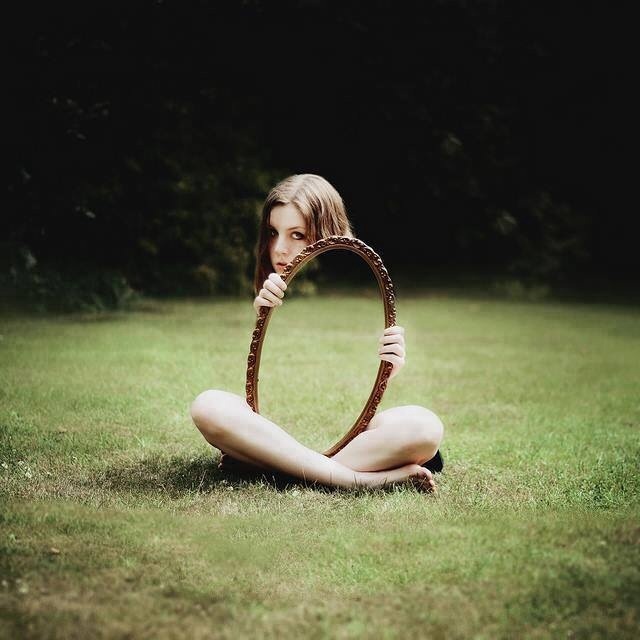 This is a telling photo in so many ways … Something immediately struck me … a mirror only reflects in part who we are. If we focus on what others see in us, we eventually end up empty and hollow … Her eyes seem lost behind the mirror, even shallow, maybe disappointment in what she portrays to the world … definitely a haunting image … thanks for sharing it! That is awesome Heidi, that she focuses on what others see in her – wow, thank you. Holy Spirit is helping me see through all of your comments. Thank you sis. I can certainly see where one could feel a bit freaked out by this photo. Beautiful but eerie at the same time. Yeah, idk who did the original. Great work. I know. But what is it about this girl? I don’t want to be a Debbie Downer, but it looks like she is the picture of abuse, hiding behind a mirror pointed outward, always serving others, hollow inside. I pray that this was just a piece of art and that the little girl is happy and fine. Whoever took this photo did a fantastic job. You are not a downer girl, your words are true. Hollow inside, abuse, no wonder it haunted me. Thank you sis. Lord, fill up all those hollow places with your Spirit and love, for all of those affected, in Jesus Name. I find it intriguing and spooky at the same time. I know, me too. Thank you, it’s not just me that sees that! I saw that picture last week and it mesmorized me. Thank you Ben, your post is awesome!